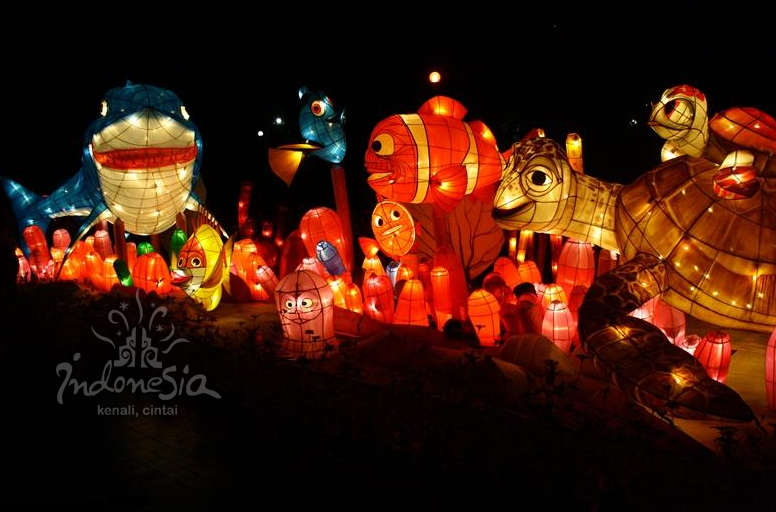 IndonesiaTravelVisit.com | Here, you can see rainbows, even in the night. Lampions in various shapes and colors will enchant your eyes. Numerous amusements are also available for you to try. People said rainbow is only visible after the rain, and it will be clear to the eyes only during the day. However, in Taman Pelangi, you wouldn't have to wait for the rain to fall or the sun to shine, as the rainbows are visible every day even until the sun sets. Yup, they are not just ordinary rainbows; they were made of lampions. 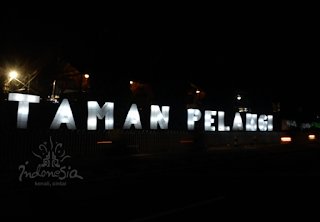 Taman Pelangi (literally translated as "The Garden of Rainbows") is the name given to the amusement park, which is located within the yard of Monumen Jogja Kembali. Designed to surround the park, numerous lampions in various shapes and colors are installed to decorate the yard. The park has two entrance gates-the west and the east gate. 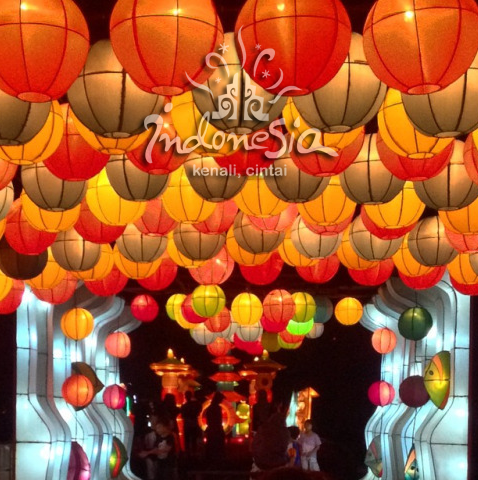 IndonesiaTravelVisit.com suggests you to go through the east gate, as you will directly be welcomed by a huge lampion in the shape of a rainbow, which also serves as the gate to the kingdom of lampions. Entering the park, we will go through a route of passages filled by various colorful lampions-shaped in floras, faunas, Japanese and Disney cartoon characters, to the faces of Indonesian's leaders. The lampions are presented in varied installation manners-some seem to be planted into the ground, some are fixed to the wall, some hanging in the air, while some others are installed in lines like a drill of soldiers. 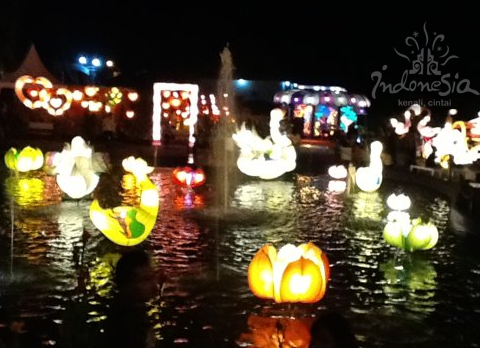 While watching the colorful night scene, we can also give a try on the various amusements-from trampoline, mini pedicab, rowboat, water balls, speedboat, bom-bom car, and many others. Seen from the aerial view, the complex of Monumen Jogja Kembali appears like a theater with huge pool divided in 4 parts surrounding it. These parts of the pool also offer water amusements you can try. Interested in trying something of higher challenge? We suggest you try exploring the Puri Hantu (the Ghost House). We have, honestly, no idea what you might find inside, as we haven't had the guts to try entering the house. If you prefer not to explore the are on foot, you can ride on a safari cart to explore the whole route in the area. It is not exaggerating to say that Taman Pelangi Monjali is a quite an all-in-one recreational site. While offering night romanticism decorated with colorful lampions and various amusements, the venue also includes a food court where you can rest and relax while trying the menus. Still haven't got any idea where to spend a fun night in Jogja? Why don't you just come to Taman Pelangi? 0 Komentar untuk "TAMAN PELANGI Enjoying Rainbow in The Night"